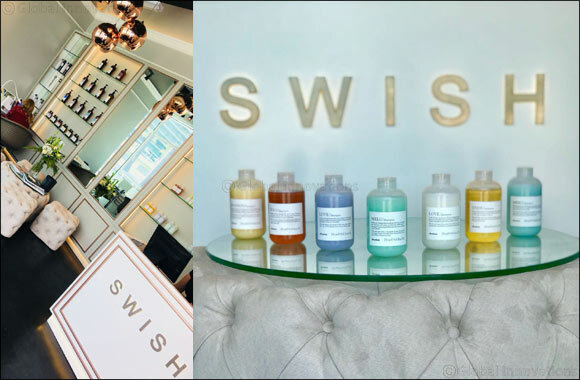 Dubai, UAE, June 3, 2018: Housed in the slickest and chicest of surroundings, SWISH by Immaclife allows you to completely switch off and relax in pure luxury. Whether it’s gazing out to sea or enjoying reading a magazine whilst your tresses are tended to, you can be sure that once you have been ‘SWISHED’, your current beauty regime will take a whole new turn for the better! The Diptyque scents and fresh flowers only add to the ambience and further enhance your SWISH by Immaclife experience. This Ramadan take advantage of 50% discount on the smoothing and straightening Keratin Treatment. Providing you with smooth, frizz-free and easy-to-manage hair with radiant shine, Keratin can be customised to each individual’s needs. Suitable for all hair types and even hair extensions, now is the time to begin your Keratin transformation before the summer and the dreaded humidity that plays havoc with our tresses! Prices start from AED 2,000 depending on hair length. A consultation is recommended first to discuss your needs. During each day of Ramadan, SWISH by Immaclife are offering a complimentary Davines hair treatment upon purchase of a blow dry. In addition, as a long running offer, SWISH by Immaclife treats the first walk-in customer of the day with their blow dry absolutely free! Arrive at 10:00am during Ramadan and you may be the lucky one to enjoy some complimentary pampering!